The Hochtief JV lined up to build the 160MW La Confluencia hydropower scheme in Chile has signed a Euro175M (US$253M) contract with the developer consortium. 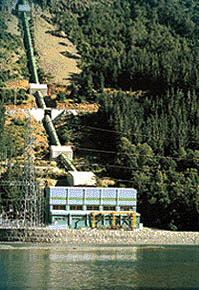 The project involves the design and construction of powerhouse to take two turbines, approximately 19km of tunnel and also two river diversions. Hochtief’s local subsidiary will undertake the work in partnership with Chilean firm Tecsa on a 70:30 basis, and the are working on a engineer, procurement and construction (EPC) contract. The scheme is being developed 150km south of Santiago by a consortium of Australian utility Pacific Hydro and SN Power, which is a Norwegian venture of utility Statkraft and the Norfund Power Invest AS fund. La Confluencia is to be built in the Tinguiririca valley upstream of the La Higuera scheme, which the developer is also building and should be online later this year. The new project is to be commissioned in 2010. Each project is to generate approximately 1400GWh annually. The total budget of La Confluencia is US$350M and approximately 60% of the project cost will be debt financed.